Durian is known as the king of fruit. We use our professional skill to select only the appropriate ripened durians. 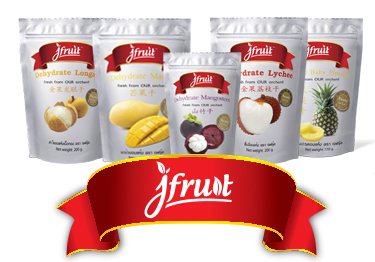 Jack fruit is a huge, spined oval fruit. It's mostly grown in tropical climates, and is the largest fruit in the world. Mango is grown throughout Thailand. Most mangoes are eaten ripened while some can be eaten raw. Ripened mangoes are yellow in colour, soft, very sweet & juicy. Coconut is a staple in the diet and is an ingredient for variety of Thai food. It provides a nutritious source of meat, juice, milk, and oil that has nourished populations around the world for generations. Cantaloupe - "colourful melon" is very popular in asian country and it's known as the honey melon that provides healthy sweet taste. Pineapple is the definition of tropical fruit. 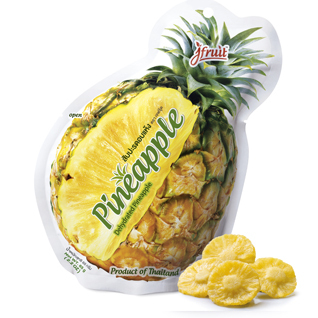 Our dried pineapple comes in large pieces, filling, and ensuring maximum satisfaction.